Thank you to everyone who keeps asking me for updates. It’s been busy around here, which is not an excuse but has been my reality, so I have been slacking. The building process has been much more demanding than the foals have, they in turn have provided me with much needed entertainment. The foals and I established a routine and now I only make small changes to it as we go. They spend most of their time in a pasture doing their important work of eating, sleeping and growing. As this photo shows they are even entertaining when they sleep. 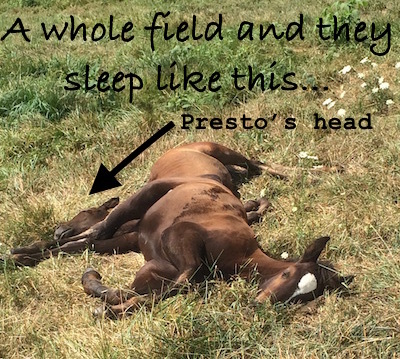 They have a whole field and this is how they sleep…lol. I feed them a pellet designed for foals under four months of age and I break the feeding into four times a day. I separate them sometimes to be sure that they were both getting the same amount. I decided they were based on two things; 1-they both look good 2- when separated they finished at the same time. Every time I walk out to feed them I whistle and call them…so I have trained them to come when called! 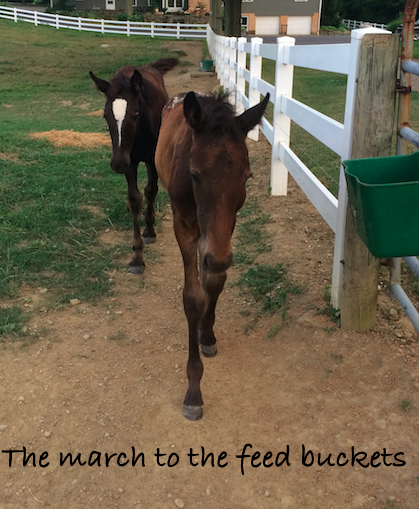 Most of the time they look like they do in this photo, marching up the fence to the buckets. Although I haven’t been posting as often on Facebook or the blog I have been doing frequent updates on Snapchat. It’s a fun way to share random videos and photos throughout the day. On the building front things seem like they are moving fast and slow. I’m very happy with the progress we have made but we still have a long way to go. I hope we can be mostly settled by the time it snows! 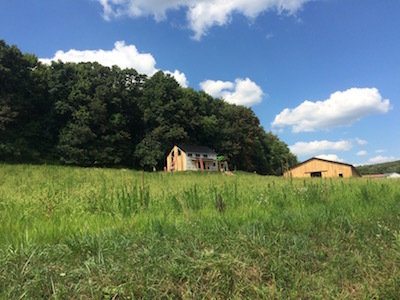 My bigger goal is to be able to host some kind of event at our place next summer….whew, that seems like a big goal as we don’t have electric, septic or well hooked up yet! Here are a few photos to show the progress. Its hard to believe that I almost live next to a state park and I haven’t been trail riding on the park yet this year. I guess I need to set that as a goal for next summer…or maybe later this fall. Have you built? How long was the process? Any words of advice? Take time to pray. Go for that ride and take a break. You can’t see the forest from the trees some time. Good thing you take pictures as you can see that you really have made progress. It will all come together. It’s all good. Go ride. You are so special. Love the web page and all you’re DVDs. God bless all of you. Good luck with the building – its certainly a lot of hard work, especially as it eats in to time with the horses ! which in hind sight doesn’t take so long to get established. drinks in the evenings – it has become like an extra room of the house ! 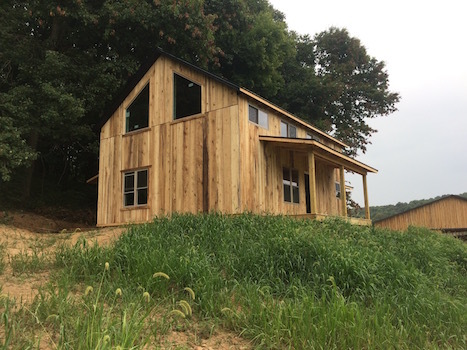 I waited, and prayed 10 years before we finally built our house. It is next door to my horse and my halter business. I’ve been here 2 years now and we are all so happy. I feed my horse everyday. Prayers for you all to be finished by snow time. I have just aquired a foal. Was nervous about it at firsr. Best thing ever. Love him. So much fun. Every moment with him is a joy. And he is so smart! And cuddly. Such a privilege. Looks real nice, wish I had some advice for you. The foals are so cute laying together like that! I’m still trying to figure out snap chat, I need a youngster to show me. When we built our home, it took a good 6 months. Be patient. It may seem like a long time now, but in a year it will be a distant memory. 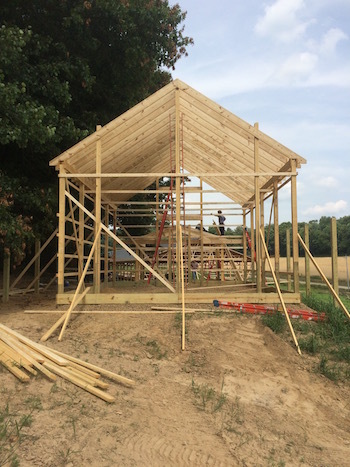 We took an old barn down in Butler and brought it down to our property in Mt Gilead to become our home. It has been 10 years and we are almost finished. It takes longer when you’re doing it all yourself, but very gratifying. Good Luck with your project! Wow, you’re really close by! Sounds amazing…maybe I’ll see you down the trail sometime.